Tough choice... There are all fun and all available this time of year.. Lately most of my anglers have been choosing big tarpon on fly.. Migratory tarpon are still marching the ocean side flats.. Not as many as in May , but still plenty to throw chicken feathers at.. What is nice is all the other skiffs are gone..
We have had a great run of beautiful no wind days..
How ever we did have a few days that were windy and cloudy.. we salvaged the day by chumming in sharks out of the wind on light bottom.. Fun stuff! 6 foot black tip will rip you into your backing fast! Been catching some nice barracudas while looking for big tarpon.... they are a blast! Under water permit release pic.. 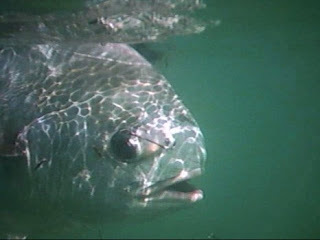 Permit are back from their off shore spawning festivities..
Finding bonefish on the same flats as the permit..